From left, "Mo The Poet," Jilla, Add-2 and Smokes hang out at Haven Studio. 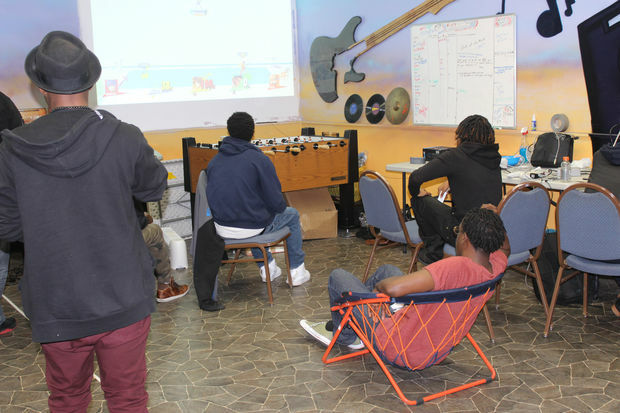 BRONZEVILLE — In one corner of the church's basement, a group of teens play a videogame. Other teens sit on an old couch nearby, laughing and talking. They are surrounded by recording equipment and other music-making materials. When a delivery man shows up with two large pizzas, everyone runs to grab a slice. Welcome to Haven Studio, a music mentoring nonprofit that launched last July. 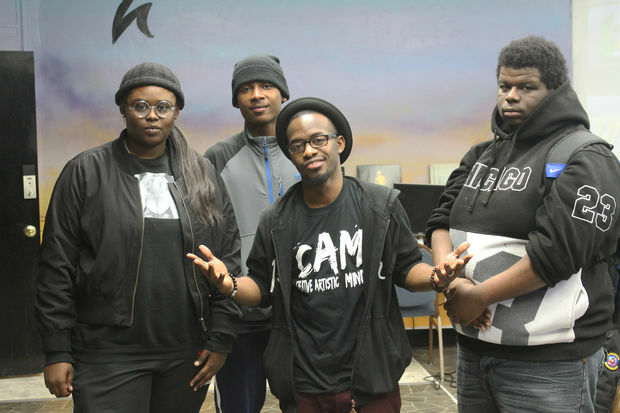 Rapper Add-2, whose real name is Andre Daniels, opened the studio to create a safe space for teens ages 14-18. The West Englewood native, who now lives in Chatham, has performed with The Roots and appeared on MTV2, MTVU, Fuse, Hot97 and Shade 45. "He is somebody who seems like he really cares about the culture and cares about uplifting people, and that's inspirational to see," said rapper Common, according to a statement on Add-2's website. These days Add-2 is focusing most of his time on the young people who come to the studio seeking a listener, studio time or just a distraction from their problems, he said. “We’ve had discussions about things like depression and suicide,” he said. Sometimes after they’re done recording a new song, he’ll talk to them about the lyrics as a way to get them to open up about their feelings. The doors are open 10 a.m. - 6 p.m. Monday-Friday in the basement of Mt. Pisgah Missionary Baptist, 4622 S. King Drive. This is his first nonprofit and he said he’s able to combine both of his passions — music and mentoring. For young adults like Bryant Jones, a Bronzeville rapper who goes by “Jilla,” the organization is a great place to be, especially when he’s going through tough times. Jilla said he lost some friends — which isn’t uncommon for other participants. That’s what led him to make music, which is another way to express himself in addition to creating art, he explained. Although he grew up on the South Side, which has been challenging, he said his surroundings don’t define him. “I feel like the system we’re in is designed for us to fail,” Jilla said, but despite that, he has overcome every obstacle so far. Add-2 helps him improve his craft and is relatable, Jilla said, adding that he can talk to him about anything. Twenty-year-old Marquita “Mo The Poet” Anderson, also a Bronzeville resident, started with spoken word and then added rapping to her skill set. It was the loss of a friend to gun violence that pulled her to rap, she said. "I lost my best friend,” she said, adding that writing became a coping mechanism. “At first it began to be poems, then I started to feel a little bit of frustration and wanted to let out a little more anger so I started writing to beats,” Anderson said. She started coming to Haven Studio in January through her friend Moses, she said. The fact that everyone can use the equipment for free is another plus. Most of the artists said they tried other places, but were charged either per the hour or a flat rate. Having access to these resources is amazing, they said. 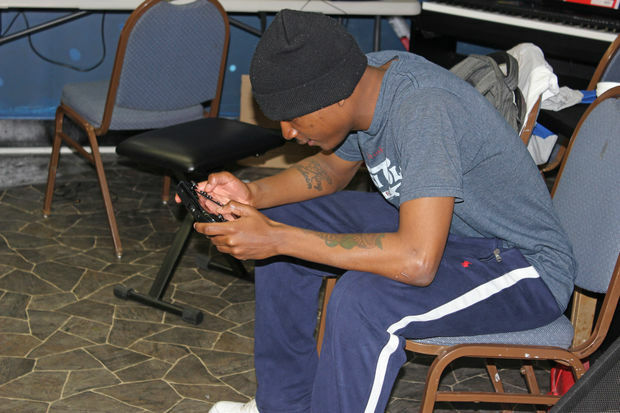 Jeffrey “Smokes” Grays, a 19-year-old rapper from Humboldt Park travels to Bronzeville to record his music. He learned about the studio last summer while working through the city's One Summer Chicago job program. Since last August, Smokes has recorded a “ton of music,” he said. “This place is a safe place for all,” he said. Before coming, he said he had his guard up because he’s heard a lot of negative things about the community. Add-2 said that his expectations have been exceeded and that he loves spending time with the teens. There are about 15 teens and young adults who drop in regularly, but the organization serves about 100 overall. He said he likes the intimate setting and hopes to see other people implement his model.